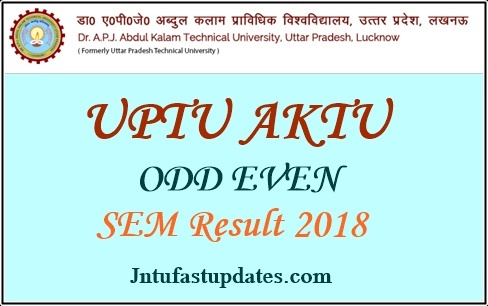 UPTu AKTU Result 2019: A.P.J. Abdul Kalam Technical University- AKTU Announced the B.Tech ODD semester results . Hopefuls pursuing under AKTU and appeared for the B.Tech examinations for even semesters 1st, 3rd, 5th, 7th semesters can shortly check the results from the official website, aktu.ac.in. the results for all branches and all years will be released at the same time. Candidates who have come across the AKTU B.Tech even semester examinations in November/December months can get ready to check the results. Along with the results, students can also check the marks, and grade scored in the examination. Check more details from the following article. Also students can check Odd Semester results for 2nd, 4th, 6th, and 8th sem results 2018 for those who attended to supplementary exams. A.P.J. Abdul Kalam Technical University- AKTU is the state-level technical university that offers various Graduate Degree and Postgraduate Degree courses for the students. The university also offers affiliation for various colleges in the state of Uttar Pradesh. AKTU is one of the government universities of the state. The AKTU was situated in Lucknow, Uttar Pradesh. Yearly, a large number of students obtain the education under this university. This university is also named as Uttar Pradesh Technical University (UPTU). The UPTU/AKTU offers various courses such as B.Tech, BE, ME, M.Tech and other courses. Yearly, the pass rate and student rate of this university are notably increasing. This university follows semester system in organizing the examinations. B.Tech examinations will be held in 8 semesters. And depending upon the course the semester examinations will be held by AKTU. The APJ Abdul Kalam University has successfully conducted the even semester examinations (for 1st, 3rd, 5th, 7th) in the month of october/November 2018. A huge number of students obtaining B.Tech course in various branches have appeared for the semester examinations. All the students those had appeared for the AKTU B.Tech examinations can check the results from the AKTU official website, aktu.ac.in. students can also apply for revaluation/recounting after checking the results. The university will announce the revaluation/recounting dates soon after the results announced. Candidates who fail in the exams/who are absent for the exams can appear for the supplementary exams as per the schedule. Stay following the AKTU official portal for latest updates. On the homepage, “AKTU B.Tech Results oct/nov 2018” Link appears; click on it. Sir this is kajal sharma. .My 4th sem result is not showing.. Please have a look on that..
Then his fee waiver seat shall be cancelled or not. Sir 4th semester ka result show ni kar Raha h….sir kab Tak show karega…..
Sir,4th semester ka result show nahi kar Raha hai ,sir kab Tak show karega result 4th semester ka…sir bahut ka show kar Raha h or bahut ka ni kar Raha h…. Sir B. Tech 2nd semester ka result kb aayega…..
my first semester exam with fees of RS ,5000 and fortunately my marks were increased after the results .I request aktu official to give me information on how I can get back my amount of rs5000 from the university ..can anyone give me details about the procedure.